Back in the spring my department was given a set of 10 iPads through a generous grant. Since then, I have been blogging all about them here at the French Corner in a series I call the iPad Diaries. Now that the posts have started to pile up, I've decided to create an index page to organize everything. I will continue to update this as I add new posts, so if you choose to bookmark this page, you won't have to worry that it's out of date. Volume 1 - I shared how we used Kahoot! and Jot! Free with the iPads. Volume 2 - I shared how we used Lino, Jot! Free (again), DuoLingo, and station work. I also shared my thoughts on the SAMR model for integrating technology. Volume 3 - I shared how we used Keynote and Jot! Free for a project. Volume 4 - I shared how we used Kahoot! (again) Move & Match and YouTube videos. I also shared my EdShelf resources. Volume 6 - I shared how we used Adobe Voice and Creative Commons to make a video about a French-speaking country while using images legally. Volume 7 - I shared feedback collected from students about the iPads. Volume 8 - I shared how we used Nearpod with the iPads. 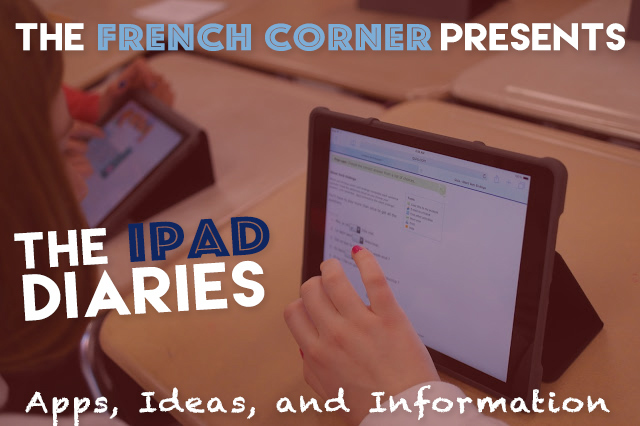 Volume 9 - I shared a presentation on the benefits of using iPads in the language classroom. Volume 10 - I shared how I use Socrative and iPad Review Stations. Volume 11 - I shared how I use the TinyTap app. Volume 15 - I shared how I used Quizlet Live with shared devices.